CWI researcher and ERCIM Fellow Yllka Velaj has won the 2018 Women@McKinsey Dissertation Award, together with Francesca Olivetta from King’s College London. Yllka Velaj receives the award for her PhD thesis 'Information spreading with network augmentation', which she completed at GSSI in Italy in 2017 and which analyzes the problem of how to maximize the dissemination of information and opinions in social networks. The award comes with a job offer by McKinsey & Company and with financial support to attend the Open Data Science Conference 2018, which will be held from 19-22 September in London. Yllka Velaj explains: "Understanding the dynamics that regulate the diffusion of information in complex networks has been one of the main goals in the field of complex network analysis. The problem, which is also known as influence spreading or information diffusion problem, is motivated by many applications in different fields: from marketing to epidemiology, going through the study of adoption of innovations and the analysis of social networks. In my PhD thesis, I designed new efficient algorithms which use a given budget to suggest new links to be added to the network in order to maximize the diffusion of information”. The thesis of the other winner, Francesca Olivetta, was about ‘Cyberbullying detection in social networks’. Yllka Velaj is an Italian scientist of Albanian origin. She obtained her BSc in Computer Science and her MSc in Distributed Systems and Computer Networks from the University of L'Aquila. She was a PhD student in Computer Science in the joint PhD GSSI-IMT programme at the Gran Sasso Science Institute in Italy. Her PhD research was done under the supervision of Pierluigi Crescenzi (University of Florence) and Gianlorenzo D'Angelo (GSSI). 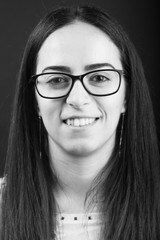 After one year as a postdoctoral researcher at the University of Chieti-Pescara, she joined the Networks & Optimization group at CWI in Amsterdam in May 2018 as a winner of the fellowship programme promoted by ERCIM - the European Research Consortium for Informatics and Mathematics. Velaj’s research interests include combinatorial algorithms, network analysis, algorithm engineering and recently also algorithmic game theory.